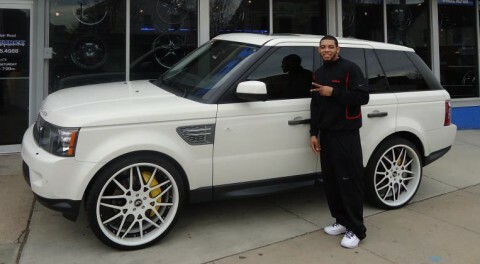 Joe Haden from the Cleveland Browns got his car customized at Rim Source Motorsports in Baltimore, MD. Kevin and the boys over at Rim Source hooked up up with a set of 24″ Maglia wheels. The wheels are painted white and black two tone with a color matched white lip. The Range seems to be sitting high a little bit but that can be adjusted automatically with a push of the button inside the car. Even though this mesh wheel design is used more for sports cars, it actually works on the Range Rover.